Unlike most gulls, the Franklin's Gull is not found near the coast during the breeding season, but nests primarily in small to very large colonies in the marshes of the Great Planes of North America. This small "black-hooded" gull is the gull most likely to be seen following plows eating exposed worms, insects, and mice. During the non-breeding season, it travels south of the Equator to protected bays and estuaries along the west coast of South America. 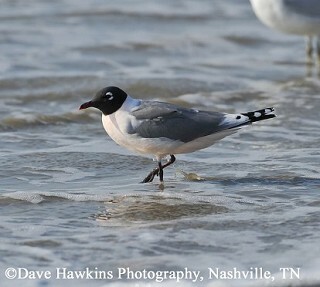 Franklin's Gull is an irregular and rare visitor to Tennessee, possibly seen in the state from March through early May, or from mid-September into December. Description: This small gull is dark-gray above and white below, with gray wings that have a white trailing edge and a small black-and-white tip. During the breeding season (April-August) the head is entirely black with a broad white broken eye-ring, and a mostly orange bill; in the non-breeding season (August-March) only the back half of the head is black or blackish. Juvenile (August-September) is brown above with a half-black heard. Franklin's Gulls reach full adult plumage in their third year. See Cornell Lab link below for more information on identification. Voice: Call nasal and laughing, but less penetrating than Laughing Gull. Bonaparte's Gull is a regular, fairly common migrant and uncommon winter resident in Tennessee. During the non-breeding season it has a dark spot behind the eye, and less dark and more white in the wing. Laughing Gull is a rare and irregular migrant in Tennessee. During the non-breeding season it shows a grayer and smaller patch on the back of the head, white only on the trailing edge of the wing, and a larger black wingtip. Ringed-billed Gull is the most regular, common migrant, and winter resident in the state. It is larger, has brown, not gray, on the head in the non-breeding season, a yellow bill with a black tip or band, and a white spot on the wingtip. Habitat: In Tennessee, it may be found on lakes and rivers across the state. Nesting and reproduction: The Franklin's Gull has never been known to nest in Tennessee. Status in Tennessee: The Franklin's Gull is an irregular, rare migrant, more often observed in the west and middle than in the eastern part of the state. This bird was named after the Arctic explorer Sir John Franklin (1786-1847) and was originally named Franklin's Rosy Gull for the pale rosy-colored wash on the breast and belly during the breeding season. Early western settlers called it the Prairie Dove. The Franklin's Gull is the only gull to undergo two complete molts each year rather than one. This ensures strong fresh feathers for its 5,000-mile migration to and from South America. Franklin's Gulls build a floating nest, which requires continual maintenance as saturated nest material decays and sinks. Best places to see in Tennessee: Franklin's Gull is always rare but might be seen on lakes and rivers across the state. It has been found more often in West and Middle Tennessee than in the eastern part of the state. Burger, J., and M. Gochfeld. 1994. Franklin's Gull (Larus pipixcan). The Birds of North America, No. 116 (A. Poole and F. Gill, eds.). The Academy of Natural Sciences, Philadelphia, PA, and The American Ornithologists' Union, Washington, D.C.